San Francisco, CA, May 19, 2015 – VIZ Media, LLC (VIZ Media), the largest publisher, distributor and licensor of anime and manga in North America, prepares a fresh round of RANMA ½ anime episodes for home media release in crisp high-definition with the debut of RANMA ½ Set 6 on June 2nd. VIZ Media is releasing the gender-bending martial arts action comedy in the original Japanese series order across seven Limited Edition Blu-ray and Standard Edition DVD Box Sets. RANMA ½ is rated TV-14 and is based on the popular manga series originally created by Rumiko Takahashi. Notable bonus features include fan interviews highlighting the RANMA ½ phenomenon and an episode summary booklet. 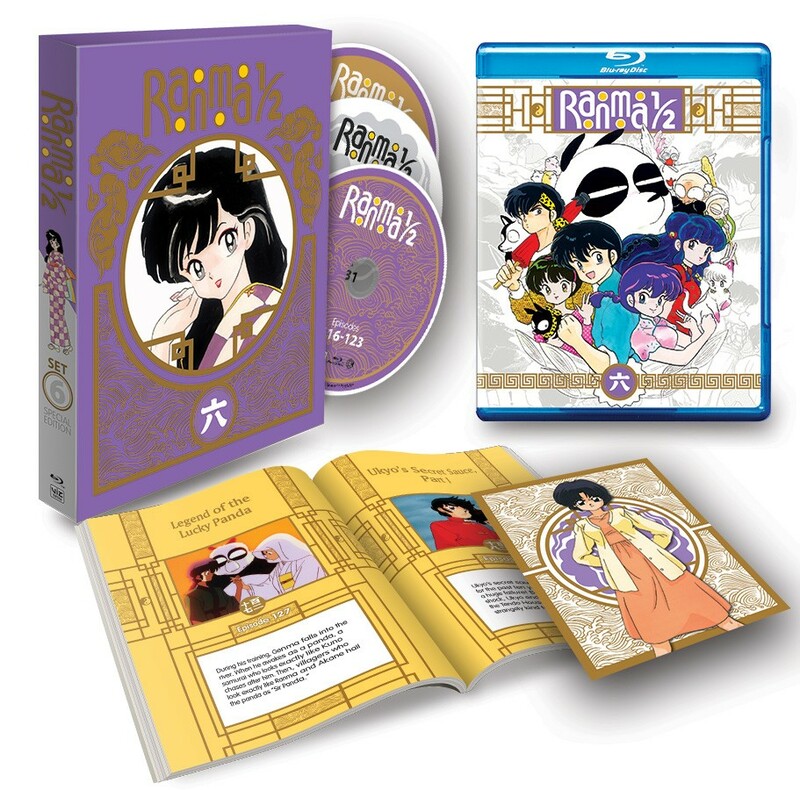 The RANMA ½ Limited Edition Blu-ray Box Set 6 carries an MSRP of $54.97 U.S. / $63.99 CAN. The latest set contains Episodes 116-138 on 3 discs, presented in full 1080p high-definition resolution with the series’ original, un-cropped 4:3 aspect ratio. Subtitled and English dubbed dialogue options are available. The Blu-ray edition also contains a full color art card and a 32-page booklet with individual episode summaries. Blu-ray bonus features include clean openings and endings as well as series trailers and special “We Love Ranma Part 6 – We Love Working on RANMA ½” and “We Love Ranma Part 7 – We Love Bloopers” segments. The set comes in a gorgeously illustrated chipboard box with embossed foil stamping. The RANMA ½ Standard Edition DVD Set 6 also features 23 episodes with the original, un-cropped 4:3 aspect ratio, with bonus features that include clean openings and endings and trailers. Subtitled and English dubbed dialogue options are available. The Standard Edition DVD set is available with an MSRP of $44.82 U.S. / $51.99 CAN. The mayhem continues in RANMA ½ Set 6! A mysterious young man who uses pantyhose as a weapon steals the Jusenkyo guestbook and kidnaps Akane. In order to save her, Ranma teams up with Ryoga, Mousse, and Shampoo, but the young man, like Ranma, also undergoes a transformation when splashed with cold water! After that, monsters escape from strange hanging scrolls and cause chaos around town! The only way to stop them is for Ranma to go on a date with a scribbled panda that has also come out of a scroll! Finally, Ukyo stays at the Tendo Dojo to recover from the shock of a ruined okonomiyaki sauce that has been marinating for ten years. Could Ranma, who is acting strangely kind around Ukyo, have something to do with that too?